There can be many problems fitting a security device to a modern vehicle, probably one of the most difficult of these is how to interface the vehicle's central locking with the alarm so the door locks work appropriately whilst arming or disarming the alarm . On some makes of vehicles modifications have to be made in order for the CDL system to work in conjunction with the alarm system. 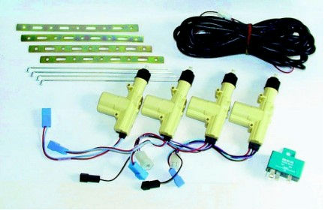 The most common of which is to add an electric motor (actuator) to the driver's door so that when arming or disarming the alarm a signal is sent to the actuator to physically lock or unlock the door. Of all these methods of CDL the only one that requires an actuator to be installed in the driver's door is the single point system. With the car ignition key unlock the front passenger door, if all the other locks open then you have a Multipoint system installed in your vehicle. If the other doors stay locked then the chances are that you have a single point system and have to fit an actuator to the driver's door (exceptions include the Toyota Corolla which implement CDL in a different way). Or is there a separate electrical switch in the dash or the drivers door (not the door locking pop up peg or lever) which locks and unlocks all the doors. If so then the system is multipoint. 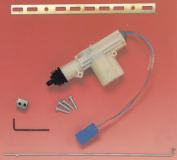 The cost of adding an actuator to a vehicle depends on the make of the vehicle. Installing CDL to your vehicle is a relatively simple though time consuming task. We have a range of kits that can be fitted by a competent person to most makes and models. The kits we supply are of Swiss manufacture (MES), are of the highest quality and are used by many manufacturers. Abacus Car Alarms Copyright © 2018. All Rights Reserved.